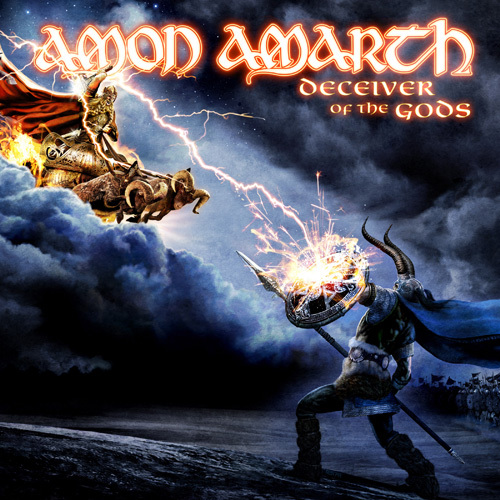 Deceiver of the Gods released in North America via Metal Blade Records on June 25, was recorded at Backstage Studios in Derbyshire, UK, produced, mixed and mastered by Andy Sneap (Killswitch Engage, Megadeth, Opeth) and is reaping critical accolades internationally. Literally invading U.S. shores, AMON AMARTH’s main stage slot on the Rockstar Energy Drink Mayhem Fest stuck awe into the hearts of media and fans alike when it opened last Saturday in San Bernardino, California. The band’s mammoth stage production, including a Viking Longboat and the amassing armies in the war between Odin and Loki, lit up the internet with excitement for the band’s set. This entry was posted in METAL and tagged Album, AMON AMARTH, Billboard 200, billboard top 200, Deceiver of the Gods, Father of the Wolf, iTunes, Loki, Messiah Marcolin, Metal Blade Records, Odin, Record chart, rockstar energy drink, Rockstar Energy Drink Mayhem Festival, UK Singles Chart, VIKINGS. Bookmark the permalink.